Anthropology lies at the heart of the human sciences, tackling questions having to do with the foundations, ethics, and deployment of the knowledge crucial to human lives. 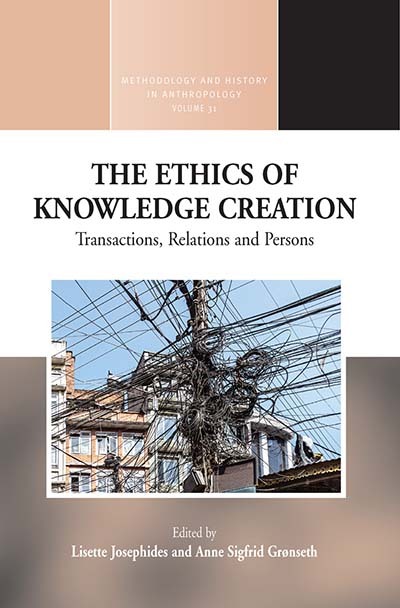 The Ethics of Knowledge Creation focuses on how knowledge is relationally created, how local knowledge can be transmuted into ‘universal knowledge’, and how the transaction and consumption of knowledge also monitors its subsequent production. This volume examines the ethical implications of various kinds of relations that are created in the process of ‘transacting knowledge’ and investigates how these transactions are also situated according to broader contradictions or synergies between ethical, epistemological, and political concerns. Lisette Josephides is Professor of Anthropology at Queen’s University Belfast. She previously taught at the Universities of PNG (1984-6), Minnesota (1989-2007), and the London School of Economics (1986-8). The Production of Inequality (1985) and Melanesian Odysseys (2008) are her most important publications on her PNG fieldwork. Her current interests focus on cosmopolitanism, philosophical anthropology and issues of knowledge and the person. These interests are represented in her two recent edited volumes, We the Cosmopolitans (2014, co-edited with Alexandra Hall) and Knowledge and Ethics in Anthropology (2015). Anne Sigfrid Grønseth is Professor in Social Anthropology at University College of Lillehammer, Norway, where she directs the Research Unit of Health, Culture and Identity, and Migration and Diversity Studies. Her research on Tamil refugees and more widely on asylum-seekers with concern for belonging, health and wellbeing engages issues of methodology, modes of knowledge, self and personhood, dwelling and humanism.